A harassment complaint filed against MSV last June during a Hoboken Housing Authority meeting was dismissed in Hoboken Municipal Court earlier today. A woman making the charge, an HHA resident was incited to submit the falsified complaint by a well known Beth Mason political operative standing next to her at its June meeting. A HPD officer came over to several people standing along the wall near MSV after the alleged "incident" saying, "What are you children?" Soon after more Hoboken Police arrived to take the woman's complaint. Since 2010, MSV has faced almost half a dozen filed complaints. The charges invariably revolve around Councilwoman Beth Mason and her well known political operatives seeking to advance her political career. The latest harassment charge was filed against MSV, this time by Beth Mason herself the week of September 15th after an initial attempt to deliver a legal subpoena. A change of venue was reported in yesterday's story. Related: The original MSV story covering the HHA June meeting: "Insubordination mounts as the Banana Republic unravels." In August, MSV was targeted during a special HHA meeting at City Hall, avoiding assault but was robbed of a camera bag containing equipment and wallet. None of the stolen items were returned and the story with unedited video was captured in "The Fracas." 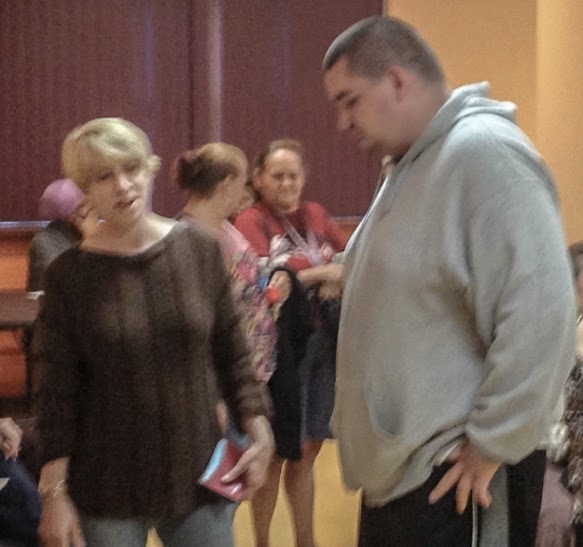 Beth Mason with her political operative Matt Calicchio at the HHA meeting. Next: More on the four hour meeting marathon. During the meeting, as MSV moved an empty chair from the rear of the room to the front and sat three feet from the HHA Board dais, a charge of being shoved filed as "harassment" was claimed by a Hispanic woman. Working in tandem standing directly to her right, Beth Mason political operative Matt Calicchio. This with dozens of people and the HHA board in sight and a police officer standing not seven feet away. The Hoboken police took the false allegation and a ticket is slated to be mailed in yet another court action against this editor. An earlier 2012 harassment charge was lodged by Matt Calicchio himself, claiming he was repeatedly contacted by MSV against his will. Calicchio's false claim he requested the alleged contact cease was thrown out of Jersey City Municipal Court. During an early recess prior to the phony harassment claim, Calicchio came within three feet attempting to take a dozen photos on his cell phone claiming MSV was "an elected official." He followed repeatedly saying, "How's your dead brother."